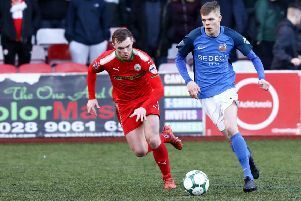 First half goals from Adam Lecky and Jude Winchester sealed Ballymena United a 2-0 win over Glenavon at Mourneview Park in the Danske Bank Premiership on Saturday. Lecky struck in the12th minute and Winchester ran clear in the 34th minute to seal the win for David Jeffrey's side who are still very much in the title race. United had the first chance of the half in the sixth minute. Cathair Friel's lob over Glenavon keeper Johnny Tuffey was going in until Caolan Marron cleared the ball off the line and the chance was lost. It was 1-0 to Ballymena in the 12th minute. Friel hit a shot from the edge of the box. Tuffey fumbled the effort and Leckey was on hand to hammer the ball home from close range for his ninth of the season. The game ebbed and flowed for the next 10 minutes with both sides looking to play football and get forward. The home side had a big call for a penalty in the 29th minute as Stephen Murray was bundled over in the box by United defender Jonathan Addis but referee Arnold Hunter waved play on much to the annoyance of the Glenavon support. 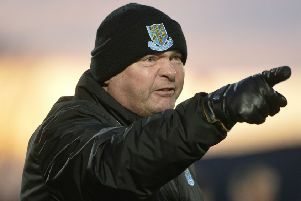 Then in the 32rd minute Glenavon assistant manager Paul Millar was sent to the stands after having words with the linesman and the home support were up in arms once again. It was 2-0 in the 34th minute. Good work by Andy McGrory and Leroy Millar resulted in Leckey releasing Winchester and the midfielder raced clear of the Lurgan Blues defence to slot it past the advancing Tuffey. The home side rallied and started to put some pressure on the United rearguard but Rhys Marshall headed wide from an Andy Hall corner. In the 42nd minute Glenavon's Josh Daniels rattled the bar from another Hall corner but United were still two goals to the good as the match approached half-time. Glenavon started the second half with a sense of purpose and were intent on pushing United back as they tried to get back into the encounter. United then had to replace an injured Winchester in the 49th minute with Ryan Harpur. The game went quiet again as both sides looked to create something but sadly both were coming up short. United's Steven McCullough tried his luck from a free-kick in the 65th minute but Tuffey was equal to the challenge and it was still 2-0 to the Sky Blues. United's Kofi Balmer then hit the post in the 74th minute as United went looking for that third goal that would seal them the three points. GLENAVON: Tuffey, King, Marron, Grace (Harmon 67mins), Daniels, Marshall, Hall (Jenkins 73mins), McCloskey,Norton (Donnelly 58mins),Murray, Garrett. Subs not used: Larmour, O'Mahony, Muir, Hamilton. BALLYMENA UTD: Glendinning, Addis, Friel (McMurray 82mins), Knowles, McCullough, McGrory, Balmer, Winchester (Harpur 49mins), Ervin, Leckey, Millar. Subs not used: Williamson, Kane, Whiteside, Faulkner, Shevlin.